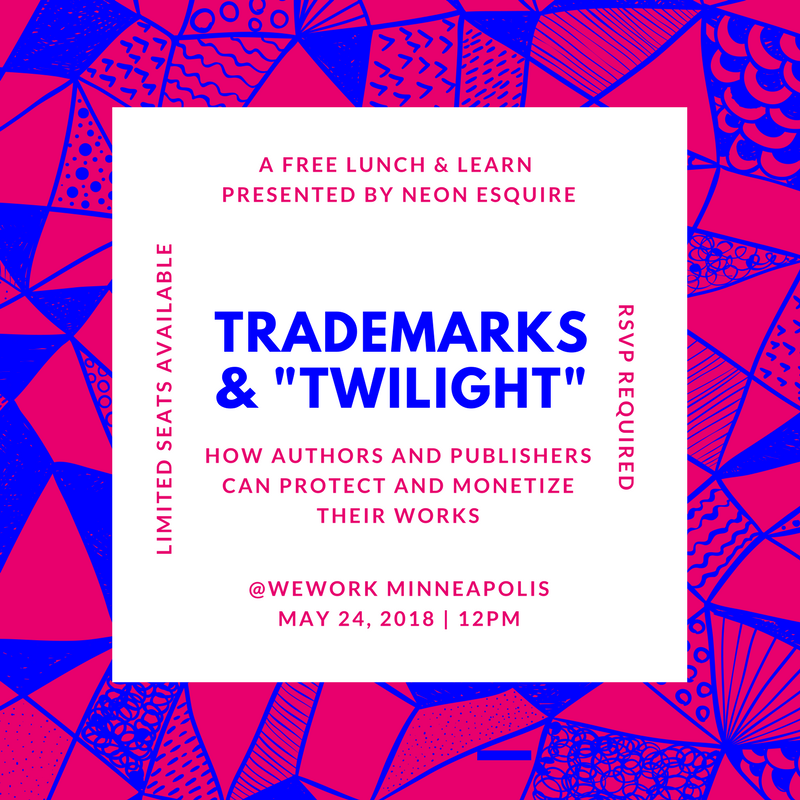 Neon EsquireEventsLunch & Learn: Trademarks and "Twilight"
Dream about creating and selling merchandise with your book’s hero on it? Wish you could develop workshops based on your original series? Long to travel the country lecturing on the concepts in your books? If so, this is a can’t miss literary-legal event! Twin Cities intellectual property attorney, Tara Murphy of Neon Esquire, LLC, has experience in helping creatives from a myriad of industries plan, protect and promote their vision from seed to full fruition. Recently, Tara has developed a special presentation for authors and publishers who want to monetize their works in new ways. Whether it is licensing merchandise for sale, organizing workshops, or becoming a professional speaker, she will go over how to effectively protect your characters and concepts in this FREE one-hour lecture. Using authors who have excelled in this area as an example, she will discuss which types of works make for strong revenue generating opportunities. Tara will specifically address the legal steps you need to consider in order to grow your own books and Bellas’ into successful brands. In addition, she will also be providing a light free lunch! Space is limited so please RSVP.